Nicholas Hanna was inspired by the Chinese custom of temporary water calligraphy when he concocted his water calligraphy device. In the video you can see his device in motion as well as traditional water calligraphy, written with a large brush. The device is mounted on a flat-bead tricycle (三!”) which is a ￼￼ubiquitous form of transportation in Beijing. Passages of Chinese ￼characters are input to a computer. Custom software on the computer ￼processes the characters and transmits them to an electrical system that ￼actuates an array of solenoid valves. 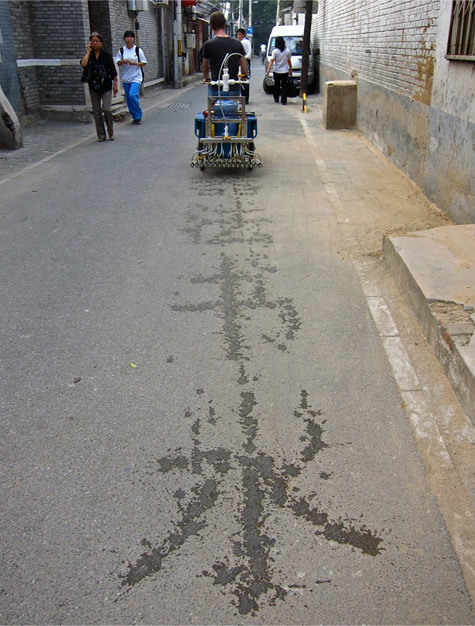 The valves release droplets of water ￼on the ground as the tricycle moves forward, thus forming Chinese characters that slowly pool together and eventually evaporate entirely.